Winter brings with it many things, including snowy days, chilly nights and the propensity for irritating beauty issues. Cold dry air outside and warm dry air inside can result in moisture loss from both the hair and skin. Not only can this be uncomfortable, but it can be unsightly as well. There are also other beauty issues that come up, like which products to use this time of year. The primary beauty concern for most each winter is dryness. Winter is the season for dry skin and chapped lips because lower temperatures and lower humidity result in drier air, both indoors and outside. Forced-air heating sources also contribute to the problem, especially if they are not equipped with some sort of humidity adding device. Dry skin becomes itchy and turns into a nuisance. Dry air can also contribute to dry hair. Dry hair tends to be flyaway and prone to static. Your entire body actually may be susceptible to static-related shocks as you traverse carpeting or pull on charged clothing. The low humidity adds to the separation of electrons and protons in the materials surrounding a person, which contributes to extra static electricity. The imbalance of these microscopic particles becomes evident when you touch something metal and a shock occurs. Revamping a health and beauty regimen for winter comfort takes just a little effort. Here are 11 tips that will benefit you and your appearance all season long. 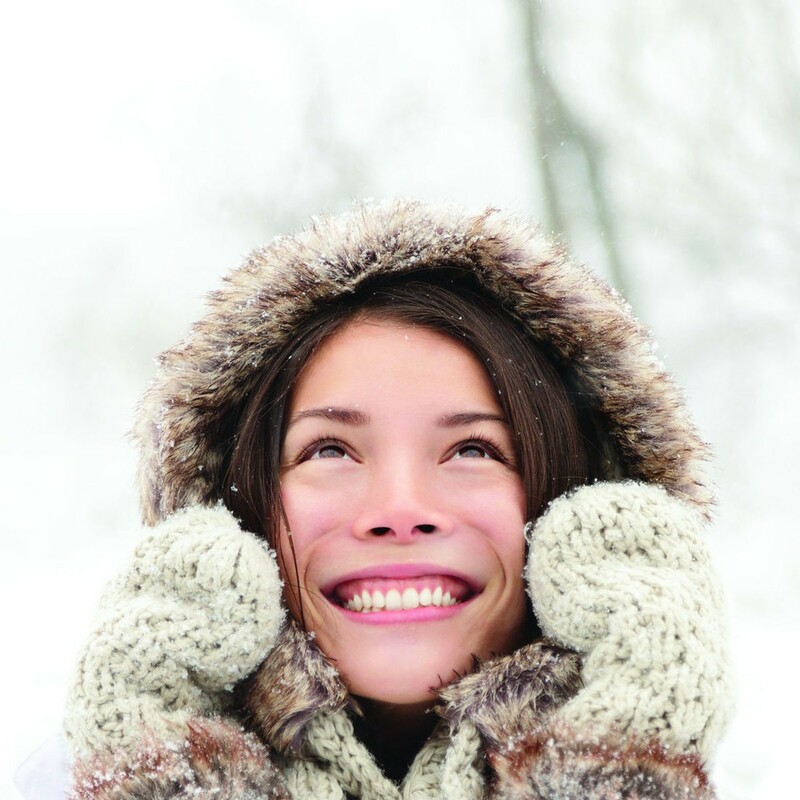 Adding moisture to your environment is one of the single best ways to combat winter skin and hair issues. This means purchasing a humidifier that will put moisture to the air. Even boiling some water on the stove and allowing the steam to seep into the air can alleviate a dry home. Dry skin can feel tight and itchy. It may or may not flake off as well. Dry skin that is consistently scratched could become irritated or even infected if bacteria gets into the skin. Moisturizers applied all over the body can help the skin retain moisture and alleviate the itchiness. Creams with menthol could provide a cooling effect that also tames itchiness. But watch out for products that also contain alcohol. The alcohol might seem cooling at first, but the alcohol could eventually dry out the skin when it evaporates. Experiment with your home's thermostat to find an indoor temperature that is more comfortable for your dry skin conditions. Very hot showers may chase away the chill from outdoors, but they can strip the skin and hair of moisture as well. Try showering in lukewarm water instead, and slather on a moisturizing body lotion right afterward. Relying on an electric hair dryer to dry your hair after washing can compound dry, frizzy or unruly hair. It may be unwise to step outdoors on a cold day with wet hair, so leave ample time in your schedule to shower and allow hair to air dry whenever possible. Licking dry lips just exacerbates the situation. Instead, use a moisturizing lip balm sparingly. Even rubbing a little olive oil over the lips can help moisturize and prevent cracking. Choose nonfoaming cleansers for the face and body when washing up. This way the soapy layer doesn't strip away essential moisture from the lipid barrier of the skin. Be sure to continue to apply an SPF product every day before heading outdoors. Ultraviolet rays are still present during the winter, albeit in less concentration. Avoid frosty eye shadows in the winter because they tend to make most people look washed out, especially when the glow of summer skin has waned. Similarly, avoid overdoing bronzer during the winter months, which can seem out of place and make the skin look artificially orange. Revamp hair color to bring out golden hues during the winter months and keep you looking vivacious. Avoid highlights that are white or ashy. Don't go for more than two shades lighter or darker in any direction for a whole-head coloring. Hat head is almost as dreaded as a bad hair day brought on by dry winter air. Hat head occurs when damp hair has been allowed to dry under a hat, which then causes flattening and denting. Allow hair to dry completely before donning a hat. And consider parting your hair the opposite way before putting on the hat, so it will have volume when the hat is removed and hair falls naturally back in place.